3M PELTOR Adapter Motorola TRBO XPR APX FL5063-34 #PMLN6095A. Thanks for looking and shopping with us!! 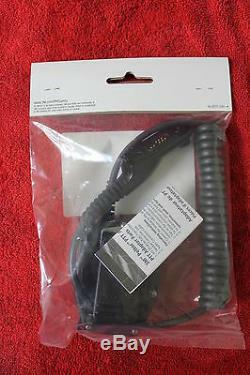 Motorola PMLN6095, PMLN6095A push-to-talk (PTT) Nexus Adapter Cable for Motorola MOTOTRBO XPR, APX series radios. Includes Nexus connector for use with Motorola PMLN6088, RLN6477, RMN4051, RMN4052, RMN5135, RMN4053 headsets. Push-to-talk button and coiled cord - cannot be used with Pelor NATO connectors. 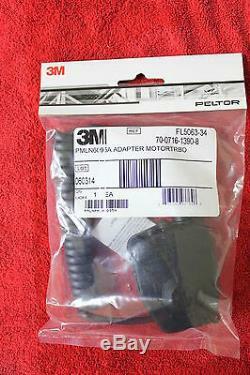 Manufactured by 3M Peltor for Motorola - same as FL-5063 non-NATO. Compatible with APX 7000, APX 6000, APX 4000, APX 3000, SRX 2200, XPR6100, XPR6300, XPR6350, XPR6380, XPR6500, XPR6550, XPR6580, XPR7350, XPR7550, XPR7580. Thank you for your cooperation. We are known for doing what we can to make our client happy. Wiscomm is quickly becoming known as the go-to supplier of communication solutions from great industry manufacturers. We proudly support our US Military and Government agencies both domestic and deployed. How can Wiscomm serve you? Your Friends at Wiscomm are here to help. The item "3M PELTOR Adapter Motorola TRBO XPR APX FL5063-34 #PMLN6095A" is in sale since Wednesday, October 22, 2014. This item is in the category "Business & Industrial\Facility Maintenance & Safety\Surveillance & Alarm Equipment\Two-Way Radios". The seller is "wiscomm_radios" and is located in Elm Grove, Wisconsin. This item can be shipped to North, South, or Latin America, all countries in Europe, all countries in continental Asia, Australia, South africa, New Zealand.